We’ve recently tried getting rid of fleas. It’s been an epic battle, so to speak. We have numerous outdoor semi-feral cats, and I’m sure they do their part in bringing parasites into our yard and to our back door. We sprinkle the cats with flea powder, and apply liquid topical flea treatment when we can get close enough to the kitties. We also have three indoor dogs, and one is a walking flea bag. 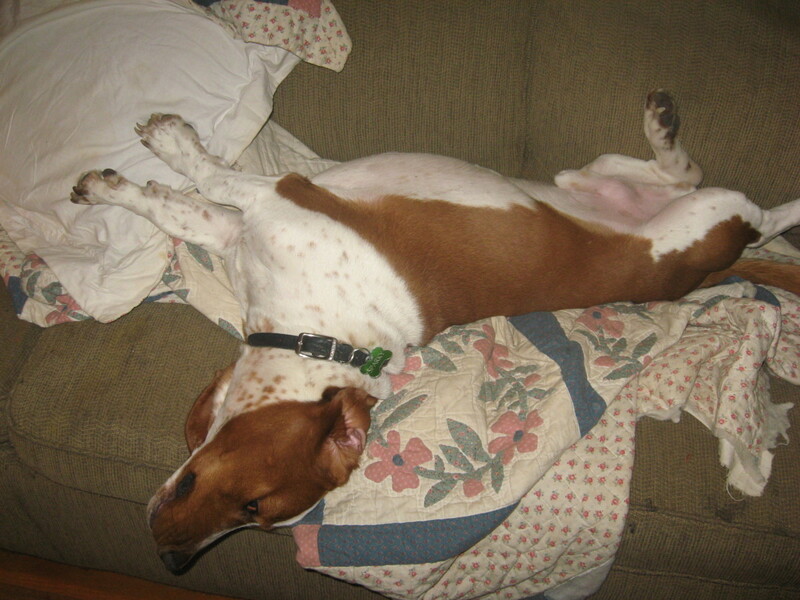 I don’t know why, but our Basset Hound is much more prone to these blood-sucking parasites than our Great Danes have ever been. 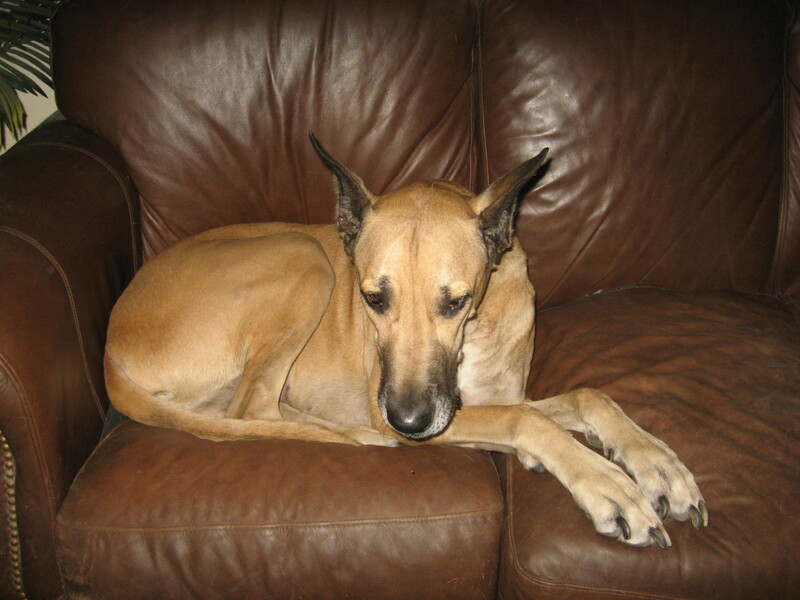 Before we adopted Sparky, the hound dog, we rarely saw fleas in our home or on the Danes. 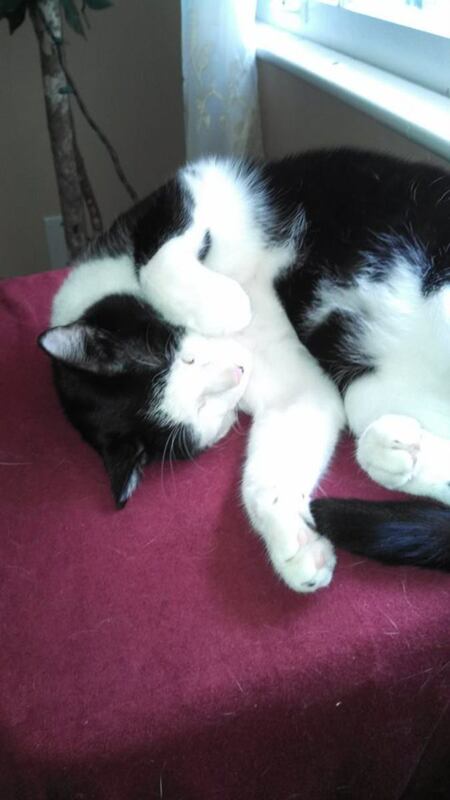 We use topical flea control on the big boys, and we assumed that it would work on Sparky, too. In the world of incorrect assumptions, this one was king. It took us months to finally discover a completely effective flea treatment—and that was just for the dog. For real flea control, you have to cover all your bases. You’ll need to treat your home, your yard, and your pet’s sleeping spots, too. Dog fleas are prolific breeders, and if you don’t stop the process in its tracks, you’ll be inundated with the tiny parasites. Read on to find out what kills fleas, the best flea treatment we’ve found, and other tips for getting rid of fleas. Try to imagine how it must feel for fleas to be crawling on you and biting you. Dogs with fleas can be totally miserable. Fleas can also affect dog health, and not just through the stress and annoyance of the itching and biting, either. Dog fleas can cause some pretty serious health problems in canines, and some can even be spread to humans. Dog fleas spread tapeworms, too. Fleas ingest the eggs of tapeworms, and when a dog swallows such a flea, the eggs are passed on to the canine. The hatched tapeworms set up shop in the dog’s intestine, and they can grow to several feet in length. And yes, humans too can get a tapeworm infestation by accidentally swallowing fleas. And here’s something really alarming: fleas carry typhus. For a long time, it was believed that endemic typhus was carried by fleas on rats only, but that’s changed. Typhus-infected fleas have also been found on dogs. More specifically, this is murine typhus, caused by the bacteria Rickettsia typhi. The infected fleas don’t cause typhus in dogs, but dogs can carry the fleas. 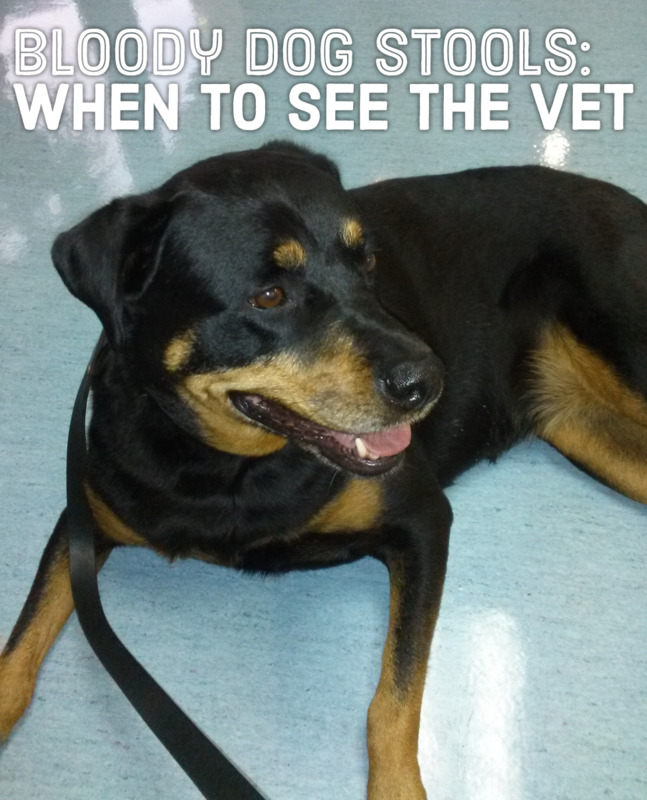 Instead of the infamous Typhoid Mary, your pooch could be Typhus Fido. Ever heard of tularemia? Here in the Deep South, we usually call this disease “rabbit fever” because rabbit hunters can get the disease from handling and skinning their infected rabbits. Tularemia can also be carried by fleas and ticks. Tularemia is rare now in the United States, but it hasn’t been totally eradicated. Here’s an infection I’ll bet you’ve never heard of: hemotropic mycoplasmosis, or haemobartonellosis. 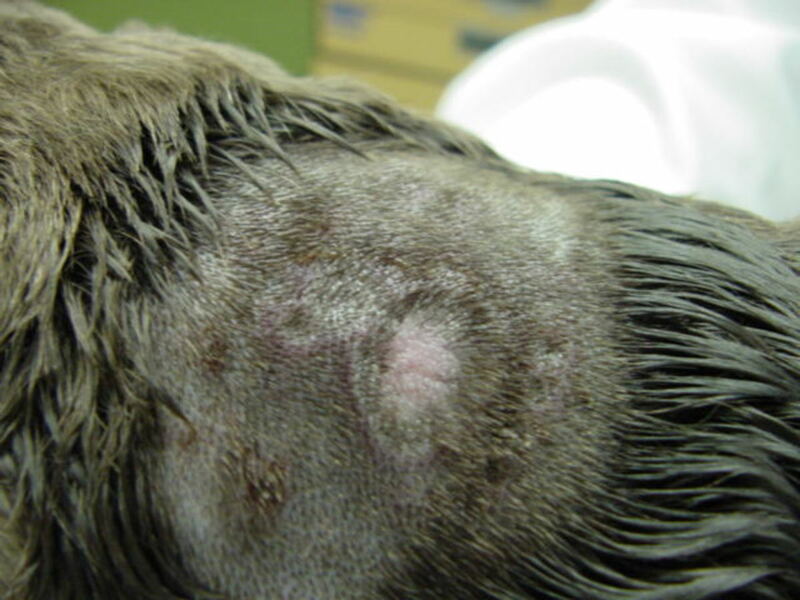 This disease of dogs is caused by bacterial parasites that damage red blood cells. Dogs with healthy spleens might not be affected much, but in some cases, the bacteria can be fatal if not properly treated in time. The bacteria can be spread by ticks and fleas. How do you get rid of fleas on dogs? What kills fleas? As far as Sparky is concerned, it’s been an uphill battle. We tried just about everything for flea control, but nothing was very effective—until recently. I’ll tell you more about that in the next section. Poor Sparky was miserable, and as responsible, caring owners, we wanted to relieve his discomfort, of course. We tried several different brands of flea shampoo, but they had little effect. We also used several brands of topical flea control, and they didn’t help much, either. 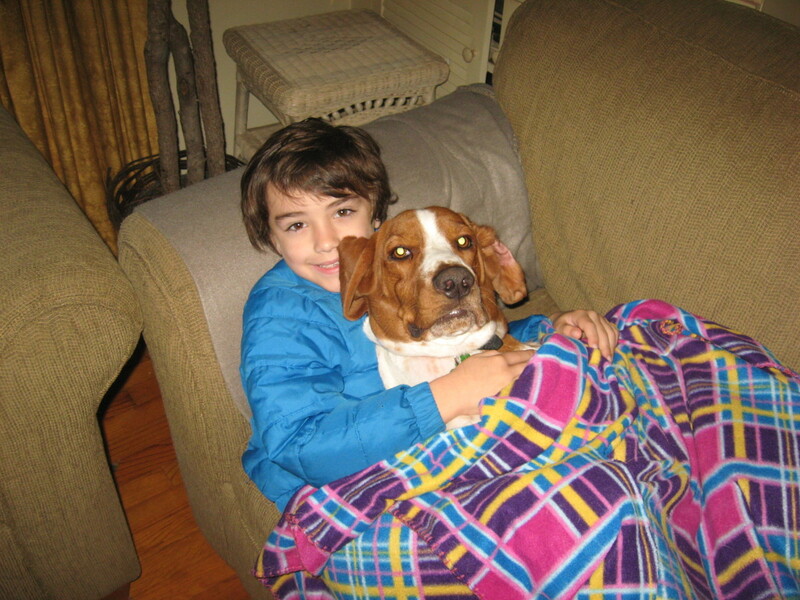 At night, when the hound dog was sitting in my lap, I’d manually pick fleas from his skin and coat. Boy, dog fleas are tough little critters! I had to do some real “smashing” to kill the little buggers by hand. Fleas on dogs are common, but Sparky seemed to have an uncommon amount of fleas and flea eggs. His skin and coat were wall-to-wall flea dirt. Flea dirt is the term used to describe the tiny black particles left behind by the parasites. It’s made up mostly of droppings, but it might also contain some particles of dried blood. Flea eggs are different, although they’re often found with flea dirt. What do flea eggs look like? They’re tiny oval shapes that are pearlescent white in color. They sort of resemble grains of salt. If you see an area on the skin or in the fur that resembles salt and pepper, it might very well be flea dirt and flea eggs. You might also find them on your pet’s bedding, where fleas are most likely to breed and lay eggs. Why do fleas like the Basset Hound so much better than the Danes? We really haven’t figured this out yet. His coat is very similar to the Great Danes’ coats, so what is it about Sparky that the external parasites find so appealing? I sometimes wonder if it’s because he’s so close to the ground. His belly is just s few inches from the dirt and grass when he’s outdoors, and when his head is down, his ears drag the dirt or grass. Maybe it’s just super easy for dog fleas to hitch a ride on a hound dog. We just found the best flea treatment we’ve ever used, and it’s cheap, easy to use, and readily available. Before I tell you what it is, let me tell you how we found out about it. After the run-of-the-mill commercial flea treatment soaps and shampoos proved to be ineffective, we went back to the pet store and purchased the most expensive and most powerful flea shampoo they had. We followed all the directions on the bottle, but we were disappointed with the results. It did kill some fleas, but it barely put a dent in the crawling, hopping population residing in Sparky’s fur. Hubby returned to the pet store and explained our plight to the owner, adding that we’d already tried their “best” flea control products. Know what he told my husband? He said to use Dawn dishwashing liquid! When hubby came home and told me this, I was extremely skeptical. How was Dawn going to work when so many commercial flea remedies had failed? We were pretty desperate by that time, however, so we gave Dawn a try. It was amazing—the best flea treatment ever! I just examined Sparky closely, and I couldn’t find a single flea, a single flea egg, or any flea dirt. I’ve been trying to figure out why this easy flea treatment worked so well. I think it could be because Sparky has an oily coat, maybe more attractive than a drier coat as a parasite habitat. Dawn is a “grease cutter,” so maybe it got rid of the oil, and along with it, the fleas. If that’s the case, Dawn might not work as well for all dogs. On the other hand, I’ve read that Dawn is toxic to fleas. I’ve also read that the lather suffocates the fleas. I don’t know why or how it works—I just know that it does, in fact, work! It’s the best flea treatment we’ve found—hands down. I’m going to explain here how we use Dawn as an agent for flea control. Hubby fills his bathtub with warm water—about six inches deep. He uses a large plastic cup to thoroughly wet Sparky’s coat. Next, he lathers up Sparky’s chin and neck with Dawn. Why start there? When fleas feel threatened by liquids being applied to the host, they’ll usually try to seek “higher ground,” which in most cases, is the animal’s head. If you apply the lather to the underside of the chin and all the way around the neck first, the parasites will find their escape route blocked. Next, apply the Dawn to the back, working the lather into the skin. From the back, move down to the sides. Apply the soap to the tail, working it in against the way the hair grows. Work on the chest and belly next, followed by the legs and paws. Leave the dog lathered up for five minutes, then use a dog brush to brush the coat all over, except for the head and ears. Dying fleas will often cling firmly to the dog’s skin, so using the brush will help loosen their death grip. Rinse the dog with clean water. You should see dead fleas and flea dirt in the dirty water in the tub. To remove fleas from the head and ears, apply a small amount of Dawn to a wet washcloth. Wipe the face and the inside and outside of the ears with the cloth. Wait five minutes, then wipe the areas with a soap-free wet cloth. Use your fingers to examine the head and ears for any surviving fleas. Once you’ve completed all these steps, drain away the dirty water and refill the tub with clean water. Repeat the bathing steps. The second bathing process should take care of any tough individual fleas that might have survived the first treatment. Make sure to rinse the dog thoroughly and not to leave any soap residue behind to irritate the skin. We don’t have a lot of fleas “running loose” in our house. Most of the tiny vampires are happily hitching rides on our pooches. Once in a great while, we might see a “loose” flea, but such occasions are out of the norm, probably because we have all hardwood floors. 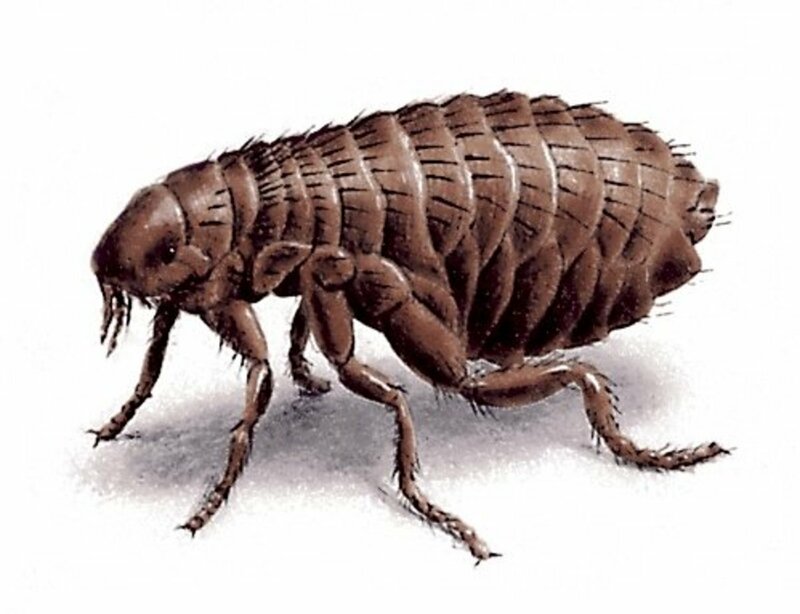 Back when we had a lot of carpeted rooms, however, fleas in the house were a big problem. I sprinkled the carpet generously with flea powder and then vacuumed it up after a couple of hours. I repeated the process for three days, and on the fourth day, I vacuumed thoroughly without using any flea powder. The process worked to get rid of fleas in the house. Some people use the same process with Borax, and excellent results have been reported. Borax can be harmful to cats, however, so if you have felines in your home, you’ll probably want to use cat-safe flea powder instead. Other methods for fleas in the house might work, too. If the pest infestation is really bad, you might consider using a flea bomb. Use one that contains an insect growth regulator (IGR). I’ve also spoken with pet owners who shampoo their carpet and rugs with a solution of Dawn and warm water, and it seems to be effective. Some homeowners actually combine a little Dawn with water in a spray bottle and mist their floors with it. When my mom got fleas in the house, in her upholstered furniture, she sprinkled flea powder under the cushions. She also sprinkled some common table salt there. She got rid of fleas in her furniture, but I don’t know whether it was the powder or the salt that did the trick. Maybe it was the “double whammy” that worked. Crushed moth balls might work here, too. You’ll also need to take care of your dog’s bedding. If your pet has fleas, its bedding and blankets most likely contain flea eggs. You can wash the bedding in hot water and Dawn liquid and then dry it in the clothes dryer. You’ll also need to wash your sheets and bed coverings, along with any small rugs and throws your dog is fond of. Another great flea treatment for inside your home is Conquer insecticide. It’s safe to use indoors and out, so we use it in both places. 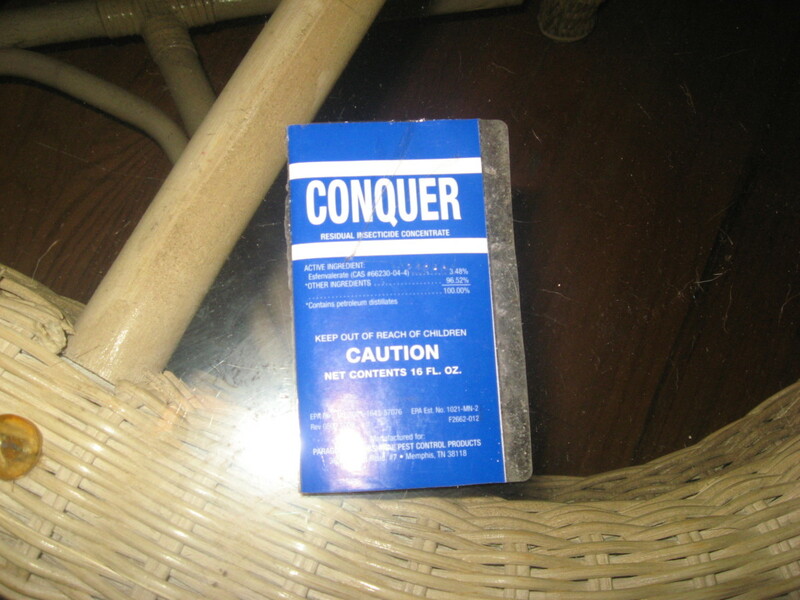 I like Conquer because it’s odorless, unlike many other insecticides. The effective residuals last for about a month, too, so it’s not like you have to spray your yard and home for flea control every time you turn around. And, by the way, this is the stuff many professionals use for getting rid of fleas and other insects. You can save a lot of money by doing flea control yourself. Getting rid of fleas is usually a multi-step process. If you have fleas in your yard, you have to get rid of them for proper flea control. It amazes me that so many pet owners overlook this integral part of the flea treatment puzzle. Think about it: Even if you kill every flea and flea egg in your home and on your pets, you’ll wind up with another infestation if you don’t take proper steps of getting rid of fleas outdoors. Unless your dog is trained to use a human toilet, it will have to make several trips outdoors every day in order to relieve itself. If fleas are living in your yard, they’re going to hop on your pooch as it passes by. Hubby sprayed our yard with Conquer Residual Insecticide Concentrate, which kills fleas, ticks, termites, ants, roaches, and spiders. He mixed it with water in a regular garden sprayer and treated our lawn with it. It works best if you mow your grass first, like a day or two before spraying the fleas in the yard with Conquer. Based on our results, I can recommend this product. If you prefer not to use chemicals like insecticides, you can find natural products that might be just as effective. After treating the yard, the house, the dogs, and the bedding, we finally find that we’re getting rid of fleas. Jo, thanks for the info! The reason washing up liquid works is that like baby soap or pure soap it lathers well. The lather blocks the tracheoles in the sides of the flea (most insects absorb oxygen this way as obviously they don't have lungs... Also why you don't find huge insects, but that is another story. Therefore this 'suffocates' the flea and they wash off dead. 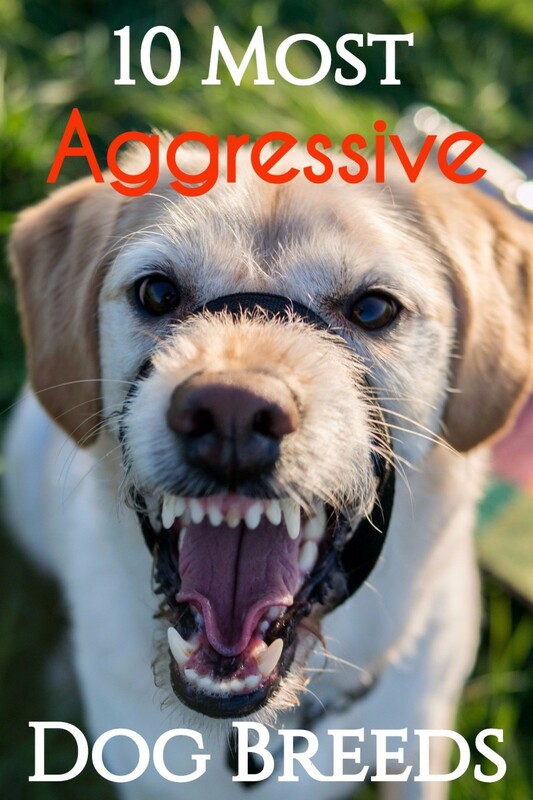 I suggest you leave the dog lathered for a good 5-10 mind and if using detergent don't get in their eyes or mouth, soap is better and works just as well. You're welcome, Debbie! Even our vet recommends Dawn for fleas. This was a very helpful tip with the Dawn liquid soap for killing fleas I'm going out tomorrow to purchase for my dog thank you. Good afternoon..... Dawn has an ingredient in it that breaks down the outer shell of fleas which in turn results in them dehydrating and dying. It does not however repel fleas so keep this in mind. For those who do not wish to use toxins in their yard, can easily purchase a canister that attaches to your hose (like one you put miracle grow in) put Dawn dish soap in it, attach to hose and spray yard down in Dawn. be sure to get all the nooks and crannies, fencing, around house, grass, etc. Apply to all yards (front, back, sides) at least 1x every 2 weeks and should remain flea free. Also, as a deterrent, I know many saw garlic is toxic to dogs, it is not if given in appropriate amounts, I am a Pomeranian breeder and have given garlic to my dogs for years never having an issue (my daughters give to their dogs as well), crushed garlic mixed in their food; 1/8 tsp 2x's a wk works great, but can also (if can tolerate the smell) mix crushed garlic in a bowl of warm water (1 tsp for every gal), stir until it dissolves (or almost dissolves), pour over dog and rub in completely, start at back of neck between ears, then around (careful not to get into eyes & nose), yes do head area first as fleas will scurry to head and face in dog will possibly swallow or inhale fleas. Work mixture through dogs coat, along back, belly, legs and tail (Do Not Forget Tail), also get underarm areas (inner parts of upper legs). Once thoroughly worked in, allow to dry, rinse well (Garlic Water kills fleas and acts as a deterrent). I am surprised that people still think that Dawn is appropriate to use on dogs. the manufacturers tell you not to wash your dog in Dawn. I strips all of your dogs body oils off and leaves the skin totally dry. It takes days for these oils to be produced and cover thespian again. Dogs, like humans, need a shampoo that has a proper PH and using anything else will harm the skin. Your vet has products that are wonderful and safe. There is nothing that will keep fleas off a dog so ridding the environment of fleas and flea eggs is of the utmost importance. Pantene Classic Clean is better than Dawn in my opinion. I worked for a vet and they used sulfate washes, which is the 2nd ingredient in Pantene. The fleas die immediately and don't latch onto the coat, so you only have to rinse. Absolutely amazing and I feel that it works 10 times better than Dawn. It's cheap, you can buy it everywhere and can use it on animals with sensitive skin. 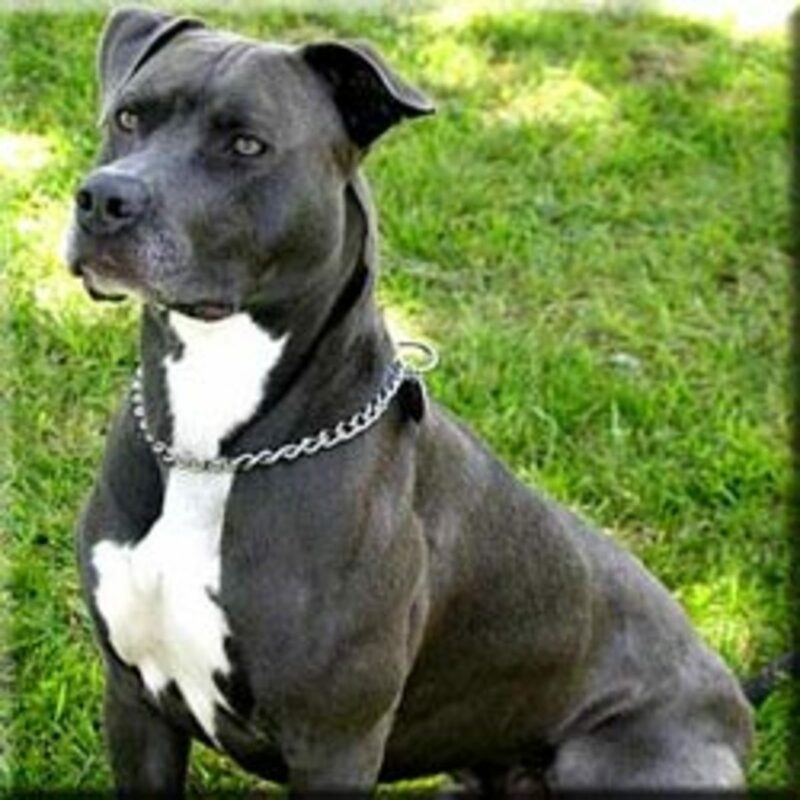 Vets ... Idk they wanted to have my male apbt neutered despite his severe heart murmur so... I try homeopathic always. Rocky, prone to allergies, got fleas at 7 (first time ever). I bathed him in dawn, salt and a tad of vinegar. I got in the tub with him (yes I'm nuts) and watched them fall off and die. One bathe. Around the house I sprinkled baking soda with essential oils and salt. Then vacuumed. For more "common areas" I used blue dawn, baking soda and hydrogen peroxide. In a week fleas gone. Rocky, because of his heart, cannot handle benadryl so I gave him half a claritin if he started chewing or acting anxious. After his baths I put a/d on any "hot spots" and rubbed his fur with oils to keep him from drying out. From a veterinarian's perspective, I am extremely skeptical of your article. While bathing a dog in Dawn may be safe, cheap, and effective short-term, it is very unlikely to continue to work over time. There are many terrible commercial products available that don't work at all- I completely agree. But the prescription products work tremendously well and over the long-term. There are also products that treat fleas, ticks, intestinal parasites, and prevent heartworm all in one treatment. Finally, "Frontline" is now available as a generic "Pet Armour" that is available at Walmart and several pet stores, so you no longer need a prescription for that product. All you do is apply between the shoulder blades and vacuum the house (as 90% of the flea burden is in eggs that are in the environment). I would recommend these products over bathing the pet in Dawn and having to deal with all of the house treatments that you suggest. These products are also available for cats, which is a much easier treatment than having to bathe the cat! (which can be a total nightmare). I've used Dawn on my dogs for years, cheap and very effective. And table salt sprinkled on carpeted floors and furniture works great, sprinkle, leave on 24 hours, vacuum, repeat! So interesting. We have a dog that's half basset, half beagle and we've had the same problem with him. So glad to have this information. Maybe this summer will be better for him. What best treatment for lawn without harming wildlife and fruits? crystal, have you treated your lawn? We live in northern Pennsylvania with two dogs and two cats one bunny a lot of fur with million extra guests don't leave. We've had tried dawn, flea dip and frontline plus with no luck. I worry about fleas every summer fleas can give people diseases. Every time I got bite I would feel sick . What best way to prepare for fleas this summer? Oceans, great to see you! funplay, I wonder why fleas seem to love hounds so much? nighthag, I hope the Dawn flea treatment works on your Goldie as well as it worked on our mutts! Fireflies, you are too kind! Thanks for sharing this information Habee! I don't think fleas are a real problem for us, but evidently the vet found a flea on my dog when she ent in for surgery. They gave her a shot to get rid of fleas, and wanted to sell us a bunch of stuff also to use to get rid of fleas. It would have been a lot of money thus the research I am doing now. I don't want them to become a problem, fleas I mean. Thanks for sharing. I wonder if you mixed Dawn with water and used in a sprayer if it would work around the yard. It is great to know that this works on your hound. I have a Bloodhound and for some reason this year has been a nightmare with the fleas. I will give this a try for sure. I also think that maybe if the dog has dry skin that this might still be useful if just followed up with a conditioner. Very useful tips thank you so much, I will be sure to try the dawn for our golden retriever as nothing seems to be working !! Voting up and useful ! This is an excellent hub. You are an awesome writer. If it has not been already, it should be selected as Hub of the Day. Useful information presented in a reader-friendly way. Voted Up and Shared. Remember to treat your cars also!!!!! Very important!!!!!!! I've been battling fleas. I think I'm losing the war. It's a good thing I found your article, I'm about to be overtaken. Great advice. I will be trying it. Love the dog pictures. Becky, thanks a bunch for stopping by! Kalmiya, using cedar chips is a great idea! Thanks! Great Hub packed with great tips and useful information. Fleas are just the worst! And you're right about getting rid of them in the yard as well. Another trick we've used is to put cedar chips every spring, just when the weather starts warming up up here in the 'Arctic', on any flower bed type areas. We have indoor/outdoor cats and I find that if I put a thick cover of aromatic cedar chips out early, it seems to help throughout the summer. Thanks for your tips, especially about Dawn soap. Liked you advice about using flea powder AND salt. Good hub. Great length. Howdy, sg. Yep, the inventor deserves everything good that he/she gets! I just couldn't believe how well the stuff worked as a flea treatment on our pooches. dogfond, I agree. I don't know how Dawn kills fleas, but it sure has worked well for us. vertualit, thanks for stopping by! Hi, Simey! We had a golden retriever like that. He'd scratch his back raw because of his flea allergy. Wish I'd known about Dawn back then. Peggy Lou, I know what you mean. I don't like using chemicals, either, but sometimes the flea situation can demand desperate measures. And we were pretty desperate! Debbie, I wouldn't have believed Dawn was so good at killing fleas if I hadn't seen it with my own eyes. Thanks for reading! Jill, I hope the flea treatment works as well for your daughter as it did for us! Wow, Doc - you even add humor to your comments! Love it! Sis, we have the exact same problem. I think our climates must be very similar. Thanks, drpastor. Glad you're back! Gypsy, most winters, we don't have enough cold weather to kill the flea population. I guess that's one disadvantage of living in a warm climate. great tips habee. Dawn as treatment for flea is an amazing discovery. We have one dog with a flea allergy - as the season is just starting we can see her beginning to get itchy! I'm going to try the Dawn treatment this weekend! Thanks for this tip!!! Thank you for posting this very useful article. Voted useful. I hadn't heard about Dawn. It's been 20 years since we had a flea infestation. 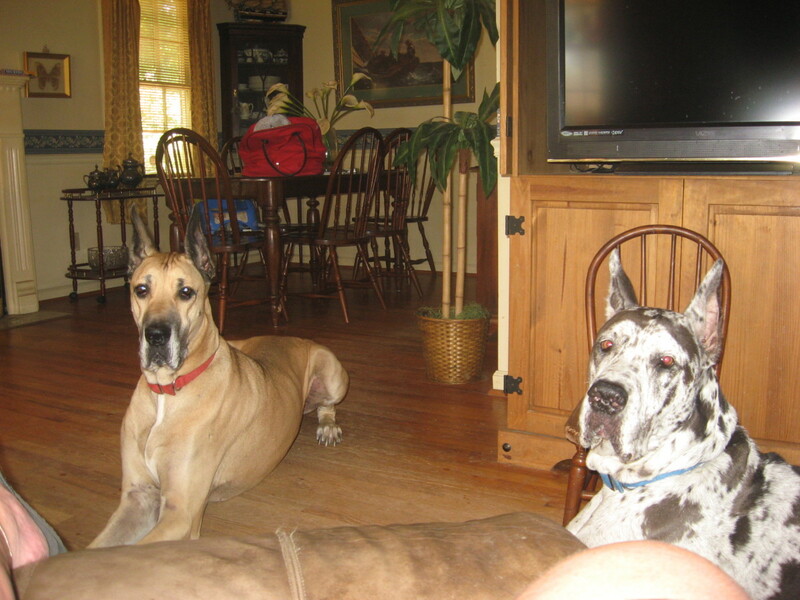 When my babies were infants, our dog infested our carpeted house and I found some on the baby. We talked to the vet and some neighbors, and took their advice to move out of the house for a few days and we bombed it with an internal fogger pesticide. I don't like using poison around the kids, but was very worried about the fleas, too. Again, thank you for all these suggestions in case I ever have a problem again. Wow! Who would have ever thought that Dawn dishwashing liquid would do the trick on the fleas! That's a great tip to remember. Thank you! I will tell my daughter about this. In fact I will send her the link to this hub. We have had a recurring bout with fleas on our dogs and my daughter has tried all kinds of treatment but with minimal success. Thanks for sharing this! Voted up and useful! If sales of Dawn haven't spiked by now, Holle, I will be very surprised. What an interesting method for flea annihilation. Have to share my favorite flea joke with you. One flea says to another, "I'm really tired from all this walking. What do you say we take a dog?" GREAT JOB! Very informational! Thank you so much!!!!! Haven't been around, been working counseling. But I am back and miss my friends!!! Come visit me when you have a chance. God Bless you! Voted-Up! Thanks for the tips. Rushing out to buy Dawn. We are lucky that in the Sierras it's too cold for flees. But my son's dog in California is plagued with the devils. Janee, that's interesting. I think we have tons of fleas here because it rarely gets really cold. They can probably breed and hatch for much of the year. Thanks for reading! Aw, seems everything happens to Sparky! Great job on getting rid of those pesty things. I guess I couldn't use Dawn since my dogs has dry skin. Fantastic tips. Your hard work paid off. Habee ,just a quick comment before I go off for another scratch ! Very good read but tell me you'll go easy on the spiders,we need 'em. You probably didn't intend it but I found it so hilarious. Sometimes when the little B......ds appear,like magic from nowhere I fill a dish with water and washing up liquid and drop the blighter's in and finito ! Oh, you're more than welcome, MsDora! What a surprise? The information was worth the suspense. Thanks you so much for sharing this discovery. Jaye, I understand completely. I prefer not to use pesticides, but I didn't feel like we had a choice. We tried everything we could find that was considered safer to the environment, but they just weren't effective. Glad you stopped by for a read! 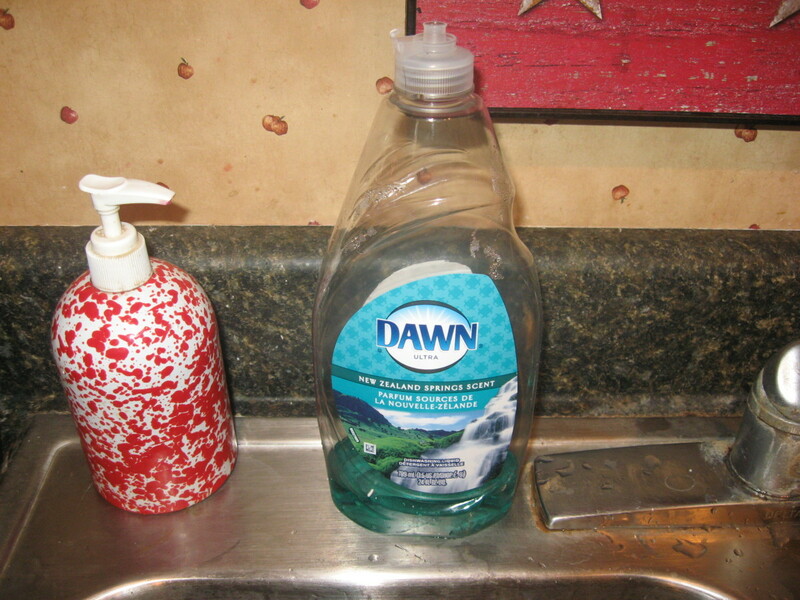 I'll keep the Dawn dishwashing liquid treatment in mind should I ever need it. It's easy to find, inexpensive and shouldn't harm the dog. Since my dog has a compromised immune system because of a major reaction to a vaccine, I stopped using chemical topical flea treatments and all other toxic products. I purchase natural products online from Natural Pet, including an ointment that is made from geranium oil and other non-toxic ingredients--used after her bath--in the same manner I once used Advantix, only this won't hurt her. Also, I bathe her in Herbal Defense organic shampoo, followed by Herbal Defense organic conditioner (no parabens or SLS like ordinary pet--and human--products. I spray her coat weekly with Herbal Defense Spray, an essential oil blend, to deter biting insects. I use All-in-One Flea Control (one of the non-toxic ingredients is diatomaceous earth) in the house. So far, these are all working, and I'm not exposing my dog to harmful chemicals. Since pesticides and herbicides (including those sprayed on grass) have been implicated in the increase of cancer in dogs, I just don't want to take the chance of using those products.